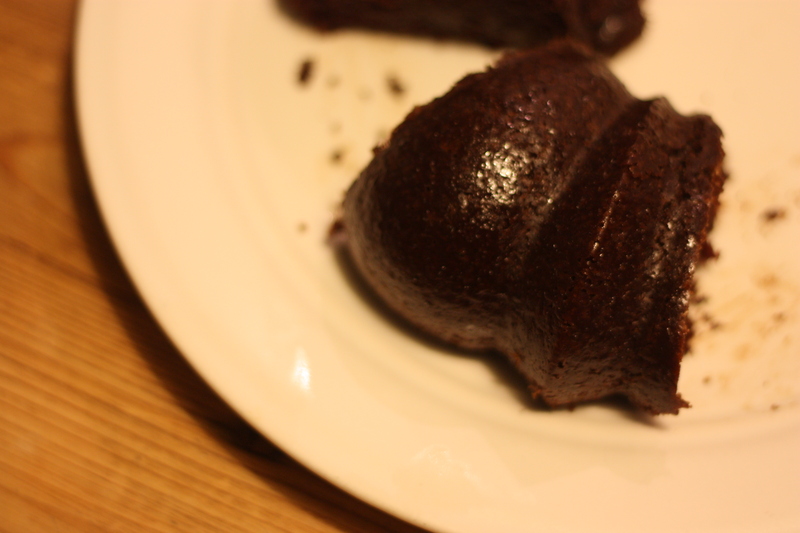 Not the greatest picture, but hopefully it gives you an idea of how dense and moist this great chocolate cake is. fast. I’m so happy with it! What a wonderful, simple cake. The author, Amanda Hesser, adapted this recipe from her mother, and published it in The Essential New York Times Cookbook. For her family, it was the birthday cake. She calls it “bouncy” and “moist;” I don’t know that I’ve ever heard a cake called bouncy before, but you know, it actually fits! The recipe calls for a frosting, but our family devoured the whole thing before I made the frosting–this is one cake that doesn’t require frosting at all (just a dusting of powdered sugar would be fine), although I can’t wait to try it, too! 1. Preheat the oven to 375 degrees, and place a baking sheet on the lowest rack, to catch any drips when the cake bakes. Put the sugar, unsweetened chocolate, butter and 1 cup of water in a saucepan. Place over medium heat and stir occasionally until all of the ingredients are melted and blended. Remove from the heat and let cool slightly, 15 to 20 minutes. 3. When the chocolate in the pan has cooled a bit, whisk in the milk mixture and eggs. In several additions and without overmixing, whisk in the dry ingredients. When the mixture is smooth, add the vanilla and whisk once or twice, to blend. “Dump” the batter into the tube pan and bake on the middle rack until a skewer inserted in the center comes out clean, about 30-35 minutes. Let the cake cool for 10 minutes, then remove from the pan and cool on a rack. (This can be tricky, so if someone is around, enlist them to help. Place a ring of wax paper on top of the cake so you have something to grab onto when turning it out–it may break in half.) Let cool completely. 4. Meanwhile, for the frosting, melt the chocolate chips in a double boiler, then let cool to room temperature. It is very important that the chocolate and sour cream be the same temperature, otherwise the icing will be lumpy or grainy. (Test it by stirring a little of the sour cream and chocolate together in a bowl; if it mixes smoothly, it’s ready.) Stir in the sour cream, 1/ 4 cup at a time, until the mixture is smooth. Taste some! It’s good. 5. When the cake is cool, you may frost it as is or cut it in half so that you have two layers (when I do this, I use 2 cups chocolate chips and 2 cups sour cream). My mother uses any leftover icing to make flowers on top. She dabs small rosettes, or buttons, on top, then uses toasted almond slices as the petals, pushing them in around the base of the rosette.